I have sold a property at 1007 9830 WHALLEY BLVD in Surrey. KING GEORGE PARK. A well maintained, Rainscreened building. West facing ’07 unit in the tower has a warm sunny balcony. This one bedroom and one bath unit is perfect for investors or first-time buyers. Functional and efficient layout featuring a gas fireplace, insuite laundry and semi-ensuite. You can walk to SKYTRAIN, SFU, Holland Park, Surrey Public Library, Surrey Center Mall, Community Centre, Restaurants, Entertainment and much more. Relax in the building's recreation center with hot tub, exercise and games room. There is secure underground parking with lots of space for visitors.YOU’LL LOVE IT! I have sold a property at 3533 30TH AVE W in Vancouver. The perfect Dunbar family home located on a quiet tree-lined street in the heart of Westside. This is a renovated, well maintained, six bedroom, five bath, three level house. There are four bedrooms and three baths upstairs with two en-suites. The master bedroom has a five piece bath & walk-in closet. The main floor has large, bright rooms, hardwood floors, nine foot ceilings, and a two piece powder room. French doors lead out to a beautiful, covered, back yard patio with water feature and firepit, perfect for summer evenings and year round BBQ's. Downstairs is family room with wetbar, two more bedrooms, a four piece bath, laundry room & your own private sauna. Close to the best public & private schools, parks & shopping. YOU'LL LOVE IT! 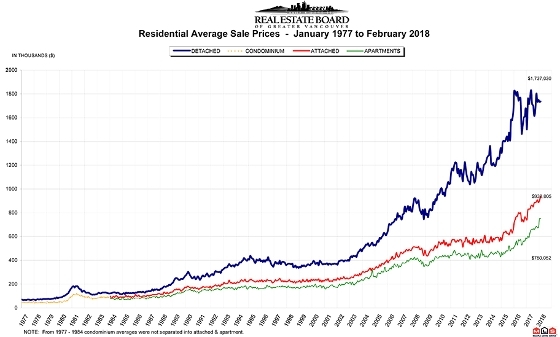 VANCOUVER, BC – March 2, 2018 – Metro Vancouver* home sales dipped below the longterm historical average in February. The Real Estate Board of Greater Vancouver (REBGV) reports that residential property sales in the region totalled 2,207 in February 2018, a nine percent decrease from the 2,424 sales recorded in February 2017, and a 21.4 percent increase compared to January 2018 when 1,818 homes sold. Last month’s sales were 14.4 percent below the 10-year February sales average. By property type, detached sales were down 39.4 percent over the same period, attached sales were down 6.8 percent, and apartment sales were 5.5 percent above the 10-year February average. There were 4,223 detached, attached and apartment properties newly listed for sale on the Multiple Listing Service® (MLS®) in Metro Vancouver in February 2018. This represents a 15.2 percent increase compared to the 3,666 homes listed in February 2017 and an 11.2 percent increase compared to January 2018 when 3,796 homes were listed. The total number of homes currently listed for sale on the MLS® system in Metro Vancouver is 7,822, a three percent increase compared to February 2017 (7,594) and a 12.6 percent increase compared to January 2018 (6,947). For all property types, the sales-to-active listings ratio for February 2018 is 28.2 percent. By property type, the ratio is 13 percent for detached homes, 37.6 percent for townhomes, and 59.7 percent for condominiums. The MLS® Home Price Index composite benchmark price for all residential properties in Metro Vancouver is currently $1,071,800. This represents a 16.9 percent increase over February 2017 and a 1.4 percent increase compared to January 2018. Sales of detached properties in February 2018 reached 621, a 16.6 percent decrease from the 745 detached sales recorded in February 2017. The benchmark price for detached properties is $1,602,000. This represents an 8.2 percent increase from February 2017 and is virtually unchanged from January 2018. Sales of apartment properties reached 1,185 in February 2018, a 7.1 percent decrease compared to the 1,275 sales in February 2017. The benchmark price of an apartment property is $682,800. This represents a 27.2 percent increase from February 2017 and a 2.6 percent increase compared to January 2018. Attached property sales in February 2018 totalled 401, a 0.7 percent decrease compared to the 404 sales in February 2017. The benchmark price of an attached unit is $819,200. This represents an 18.1 percent increase from February 2017 and a 1.9 percent increase compared to January 2018. I have sold a property at 407 9830 WHALLEY BLVD in Surrey.